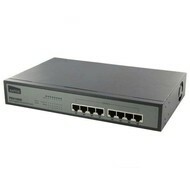 NETIS PE6108G Unmanaged 8-Port Gigabit Switch with 8 PoE Port 120W IEEE802.3af/at (All 8-ports PoE) - NWCA Inc. The Netis PE6108G Gigabit Ethernet PoE Switch provides a great selection for expanding your home or office network. Each of the eight 10/100/1000Mbps RJ45 ports support Power over Ethernet (PoE) functionality. It can automatically detect and supply power with the IEEE 802.3at/af compliant Powered Devices (PDs), like PoE APs, IP Phones, IP cameras, etc. In this case, the electrical power is transmitted along with data in one single cable, allowing you to expand your network where there are no power lines or outlets.